Encouraged by the success of our grinding machines cycled SE, LIPEMEC has elaborated from the same mechanical basis, a new series from Flat grinding machines with CNC. 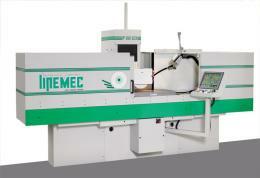 Developed on the digital control, already tested with successful with the model RC250CNC cylindrical grinder, this Flat grinding machine will allow to add several cycles (surfacing, grooving, etc…) and especially to profile the wheel with automatic compensation of the diameter and cutting speed. Declined in 3 capacities 400x200, 600x200, 800x200, this series of machines entirely enclosed in housing, facilitate the work of the operator by the use of predefined conversational cycles direct without programming.